A Smart way to serve your customers to their total satisfaction. Introduction: Token Display System are ideal for Banks, Airports, Public dealing offices , Hospitals , Doctors Clinics, Restaurants and other such places where people have to wait in line for their turn. These systems allow customers to wait without having to stand in line, once their number is displayed then only will they have to get in line for their turn . Musical chime for calling number. Customized products are also offered at very reasonable prices. Voice Announcement in Hindi and English. Simple operation and easy to install. 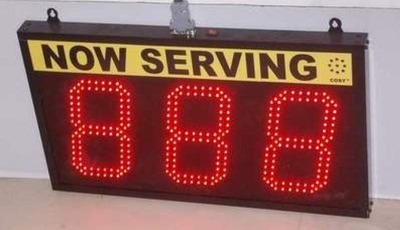 Large size 4 inches high LED Displays. Robust , heavy duty ,sleek designs in ABS plastic molded cabinets. Multi-Counter displays and custom designed systems for efficient Q-management. Parallel and Double sided displays available. Largest range of Token Display systems in India . Serving successfully to many Govt. departments , banks, Hospitals ,doctors , Restaurants, Canteens etc. in India and abroad. All systems are manufactured with user friendly features and are very easy to install. All systems are fully connectorized so that any ordinary person can install the system within minutes. PC Interface : All above single counter models of displays are also available with RS232 PC interface at same cost . A small windows based application software will be supplied as shown above . 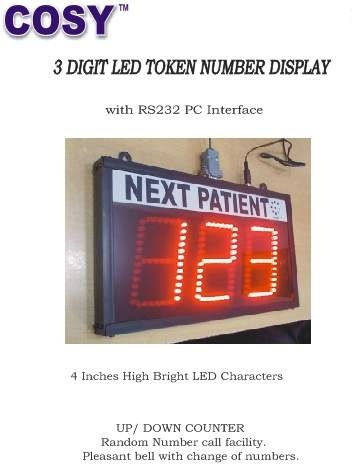 Just type the required number in window using PC keyboard and press Send button to display the numbers in the LED display . It is also possible to serially increment and decrease the numbers from a preset number . Random number call also possible during calling numbers serially without disturbing the series . A short duration tone will sound with every change of number . This is a small window and can be dragged at any suitable location in PC screen while operator can continue to work in other applications . This unit can be ordered to connect display with PC for communicating with displays at distances more than 30 meters . It is possible to communicate up to 800 meters away from PC with this interface using a single pair cable . All models are easy to install , operate & maintain. 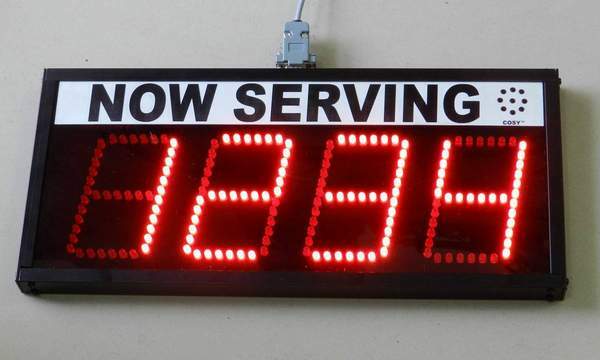 Any ordinary electrician can do the installation quickly.Now also available token number displays with automatic calling counter number display. 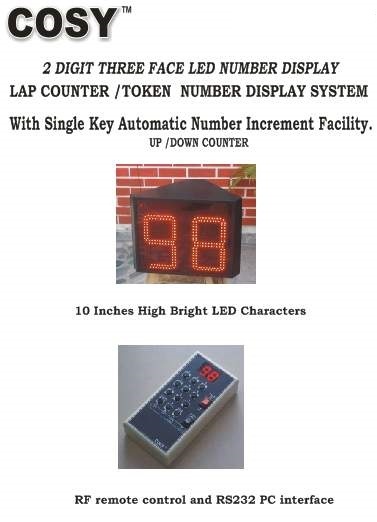 Automatic increment of token numbers with display of calling counter number is ideally suitable for serving offices with many counters. No need to make your customers stand in long quos in sunlight or rain and wasting time. 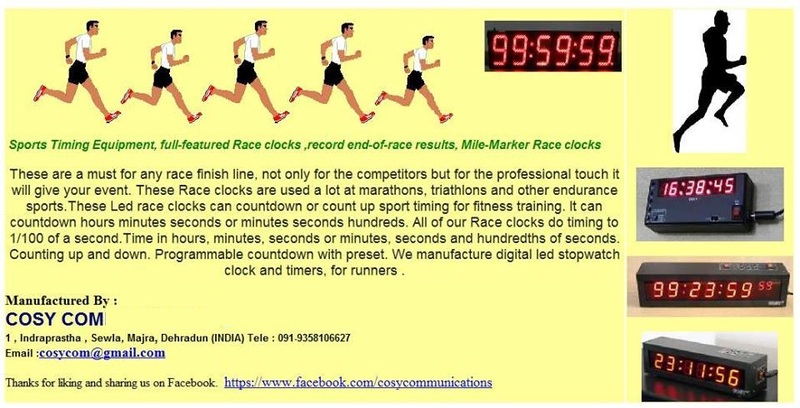 Just distribute tokens on first come first serve basis and as soon as any counter is ready to provide services the person there just has to press one push switch to show the incremented token number and respective counter number in displays. Also possible to attach more than one display with a single system. Model for 5 or 10 counters available. Above prices are for displays having digits in 5 MM RED LEDs . We also manufacture displays with 4" seven segment FND displays at extra charges .